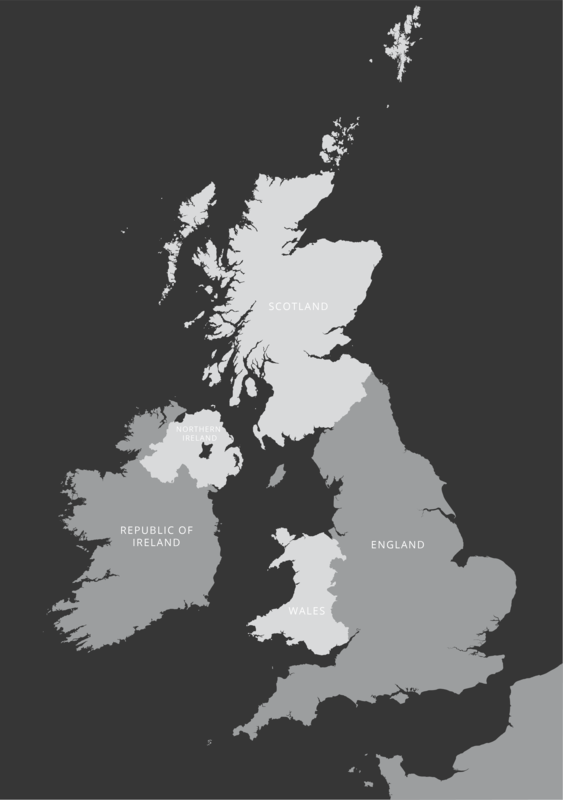 Our detailed outline of the British Isles can be scaled at anything from thumbnail up to poster size. It has superb coastline detail that includes literally hundreds of Scottish and Irish islands. Even far-flung St Kilda is plotted, along with islands that are otherwise often shown as part of mainland Britain, such as the Isle of Anglesey. We know of no other vector base map of the British Isles that has so much detail and accuracy to its coastlines for this price. Easy option layers allow you to show the UK and Republic of Ireland, and/or the UK components of England, Scotland, Wales and Northern Ireland. There is a layer for country boundaries and colour fill layers for each country that can be turned on and off easily. Lough Neagh in Northern Ireland — the largest lake in the British Isles — can be shown if you want. Check out the map of Britain and Ireland with major cities and roads.